I have returned from women’s sacred space and been nourished and nurtured. 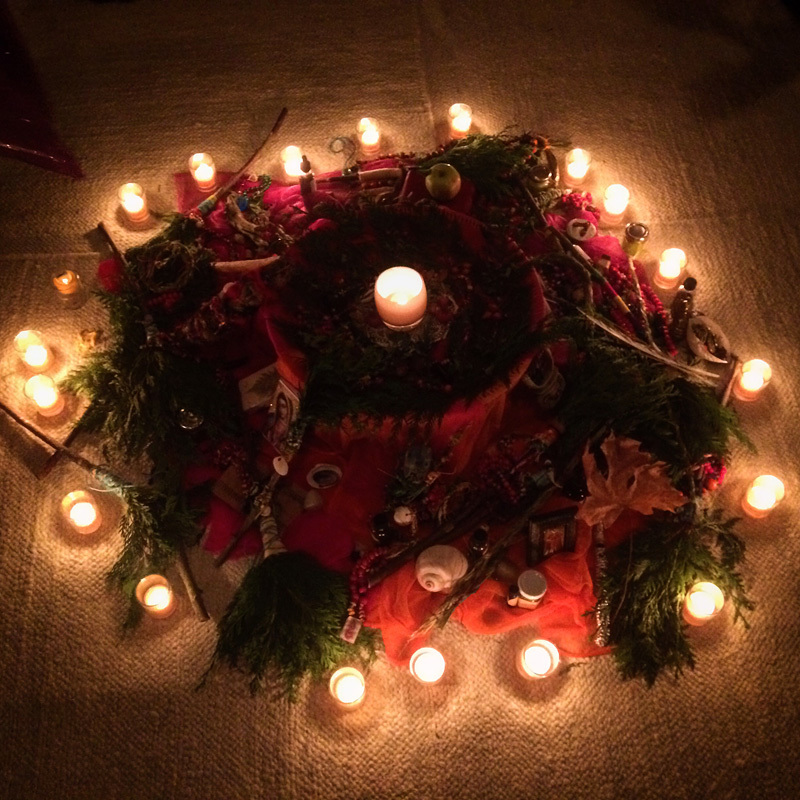 For five days I sat in a circle of women and together we made a beautiful rosary, gathered on a strand of spirit work, anchored by the Sacred Mother, to tell our “beads,” our stories, our prayers, our wishes, our love. 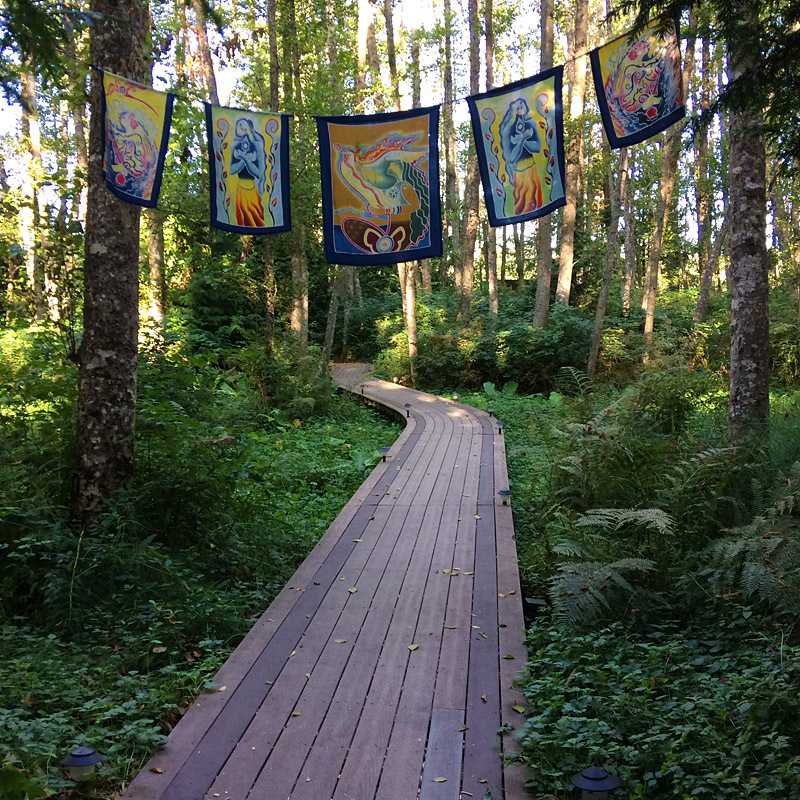 I made the pilgrimage to Whidbey Island in Washington state to attend a Gaian Soul Retreat at Aldermarsh Center in mid-September. 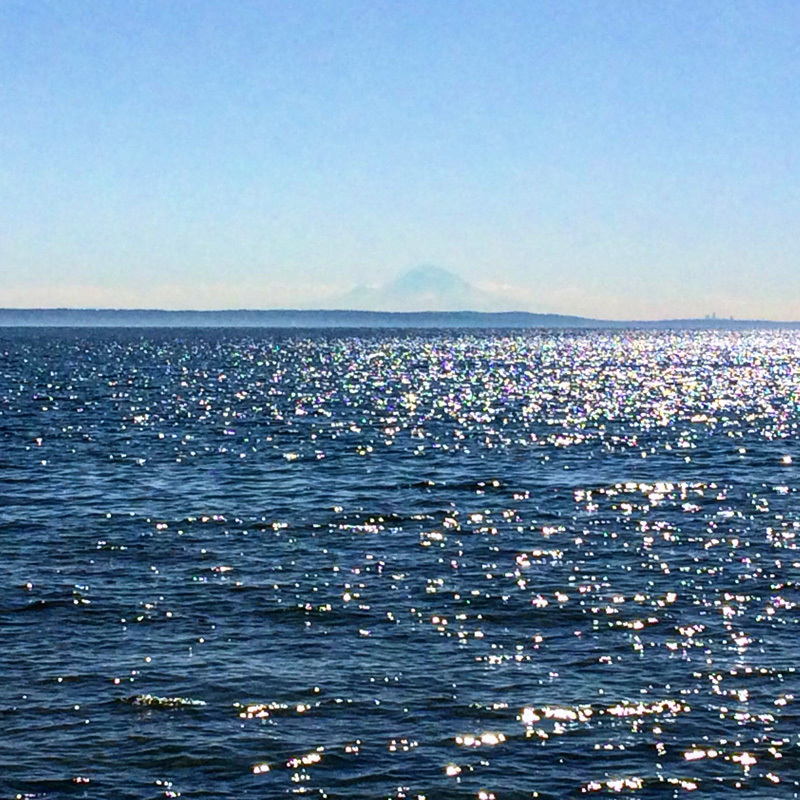 It was a sweet experience, and as one woman described it, a “chance to swim in the sea of the sacred feminine.” I have been away from women’s circle for a long time and was a bit trepidatious to return. But I know what that connection feels like, and my soul was hungry for it. I have made circles for my family, but now it was my turn to receive. I’ve known Joanna Powell Colbert for many years. Our meeting is lost in the mists of time, but originally we loved each other’s artwork and so became friends. One of her arts is gathering women in circle. 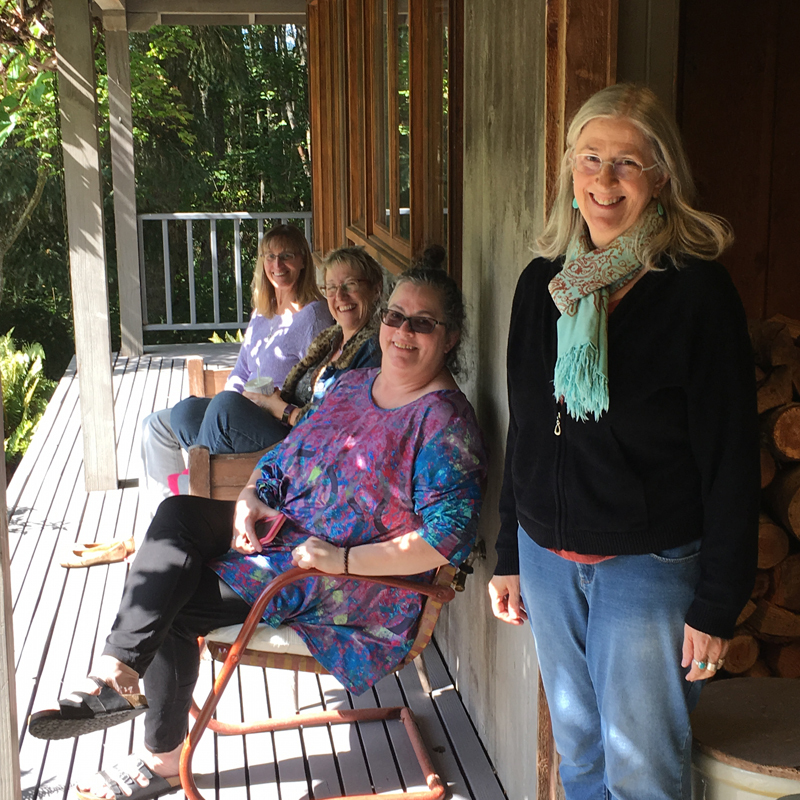 She has been making her Gaian Soul retreats for several years now, and her spring and fall retreats are for alumni or by application only, with a new retreat added in August for newcomers. At this retreat, I was the only new person there, but I was swiftly enfolded, shepherded and welcomed into the circle. All of Joanna’s planning and knowledge made for a safe container for eighteen women to share. Joanna is a gifted circle leader and knows how to keep boundaries that still allow for profound exchange. The sharing is deep. The humor is high. 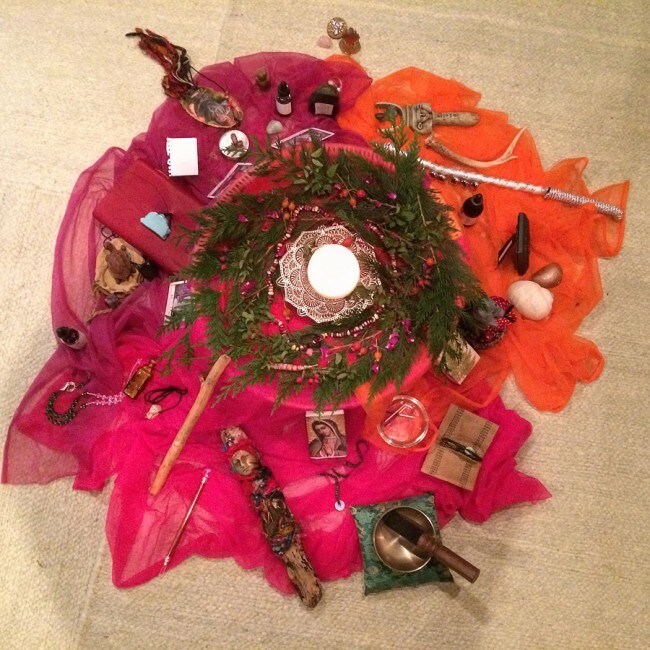 I may have been away from women’s circle for a long time, but it was easy and sweet to drop back in, and to find my spiritual and psychic balance again as we approached the equinox time. On the first day, I walked off the plane and realized immediately that I hadn’t brought enough warm clothes. Packing in a heat wave makes it hard to think of the cold. But the Pacific Northwest, a thousand miles north of where I live in middle California, is noticeably cooler. I wore most of my clothes most of the time, but was smart enough to bring a light down jacket which I pretty much lived in. At the airport I soon found other arriving women and was scooped up into a group and into a car. Crossing the water on the ferry ride to the island felt like a threshold. That first afternoon, overwhelmed from the travel, from overwork, and already in tears, I laid down and eased into a long deep nap. And thus I arrived, calmed and ready to feel all the feels. Our altar for the opening circle, with a sacred object added by each woman, promised the beauty to come. The days and evenings were full. We met every morning at 9:00, had a generous lunch break, and then afternoon circle and crafting, with evenings given to wonderful sharings of art, dance and song. The sleeping rooms were comfortable, even with shared bathrooms, and the mealtimes delicious with food and laughter. 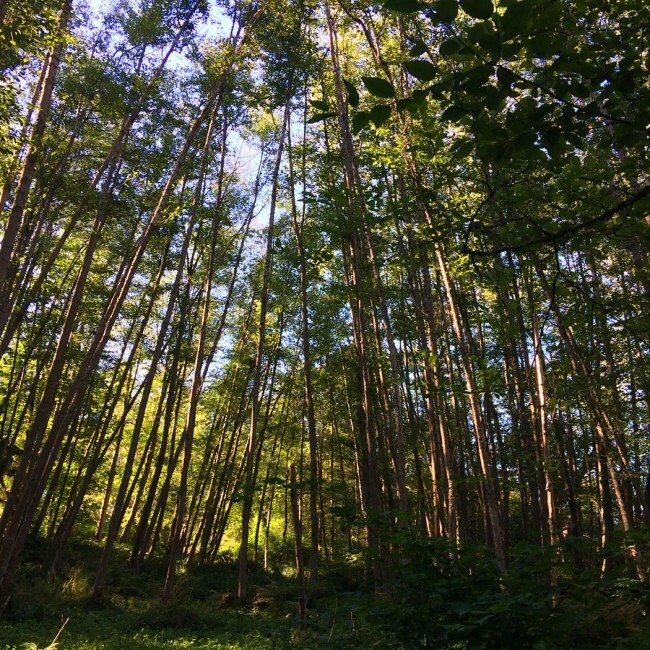 Passing through a green alder cathedral on the wooden boardwalk across the marsh to and from the ceremony house was an act of immersion and reverence, four to six times a day. One of the many things that drew me to this retreat was the promise of wildcrafting and making herb medicine. Latisha Guthrie was our herbal goddess, bringing her deep wisdom and knowledge of the trees, bushes and berries to us. 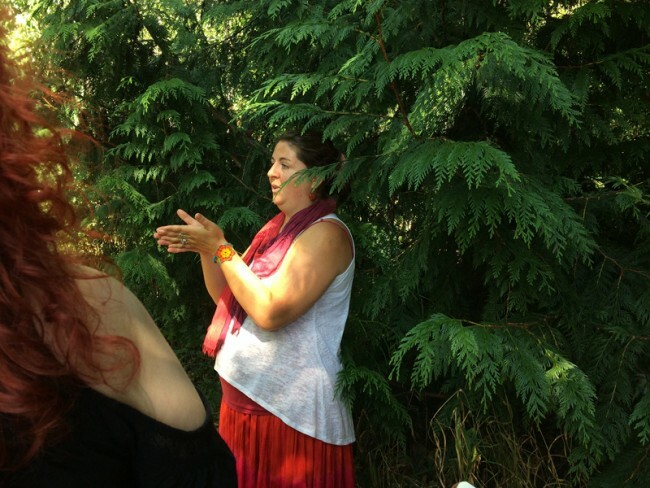 We made salves, smudge bundles and brooms from the western red cedar, thuja plicata. 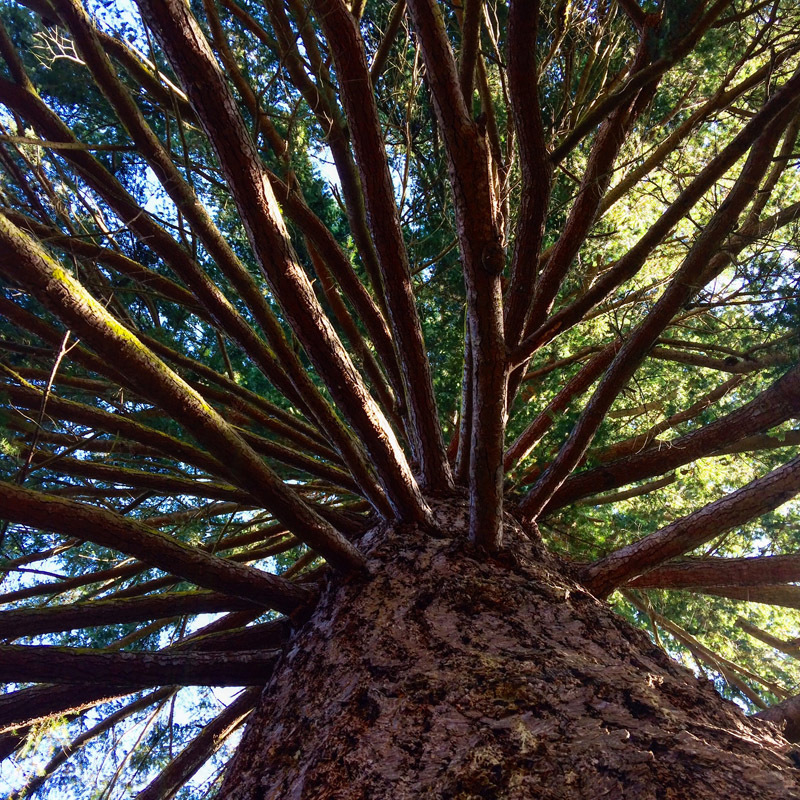 This tree, which only grows in Cascadia, has been a sovereign anti-fungal medicine for me for many years, thanks to my young herbal friend in Oregon who introduced me to it. This is an ongoing need for me, and so on this trip, I gathered a quantity of cedar branches to bring home with me and make my own tincture. I also gathered a smaller quantity of usnea, a lichen that has been a good helper for me to cure bladder and other infections. Latisha showed me how to identify it from a similar lichen growing on the bark of trees, particularly alder and cottonwood, by pulling apart a stem – these are tiny! 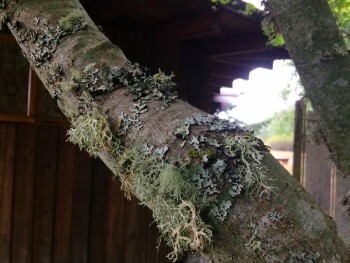 – until I can see a minuscule white thread remaining – this identifies the lichen as usnea. I have since discovered Latisha’s luscious Instagram feed @herbmother. One afternoon we made botanical rosaries. I didn’t manage to complete one, so have brought home some of the dried corn, rosehips and rowan berries to make my own when I have more time. 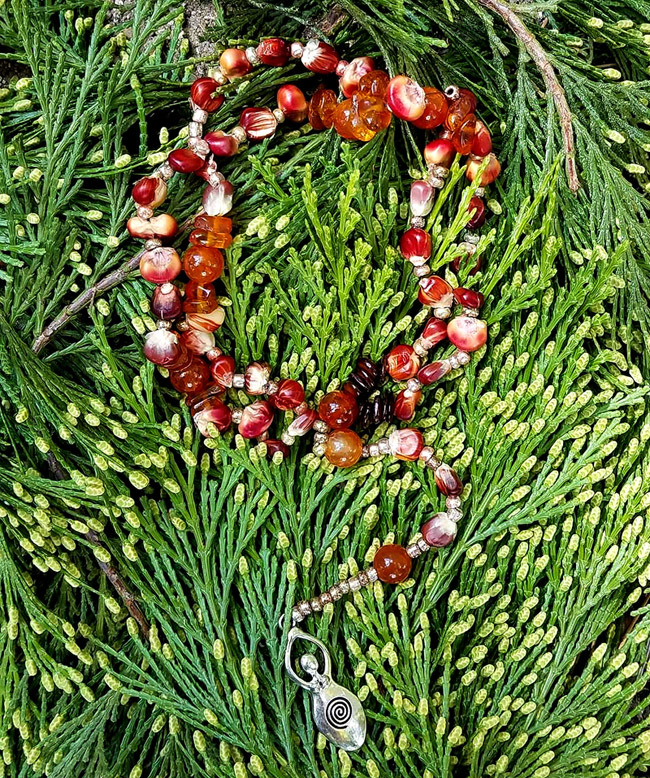 The ones made by the women were lovely, such as the one pictured above by Jessica Bowman using maize and amber with a goddess pendant (and photographed for me by special request, in a nest of cedar). Pictured below are some made by Latisha for examples. 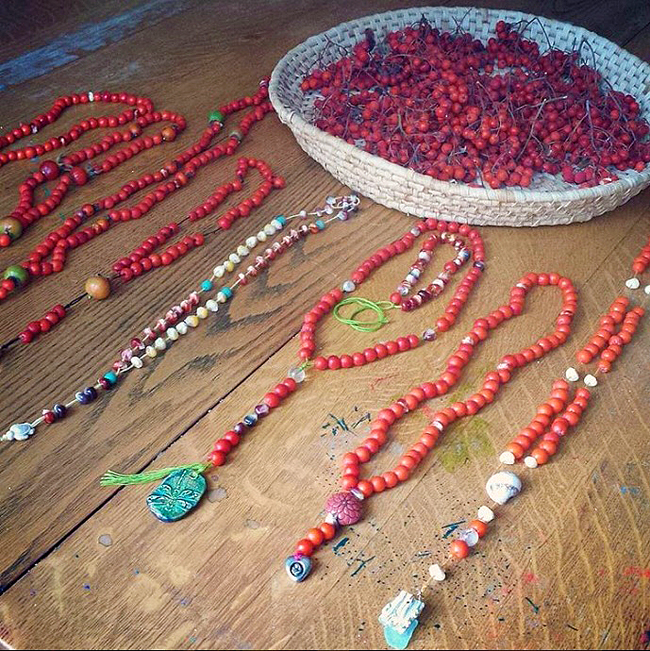 We used five sets of nine beads – there are various ways to make and count prayer beads among many religions – for a prayer for the Holy Mother, Maker of All Things. We listened to music by Jennifer Berezan: Returning, and She Carries Me, which has this chant. We walked the land, observing flower and seed, cone and leaf. Joanna’s “bible” and a book she highly recommends, is Braiding Sweetgrass by Robin Wall Kimmerer. We learned to practice reciprocity with the plant world: first to notice, then to express gratitude, then to give back. 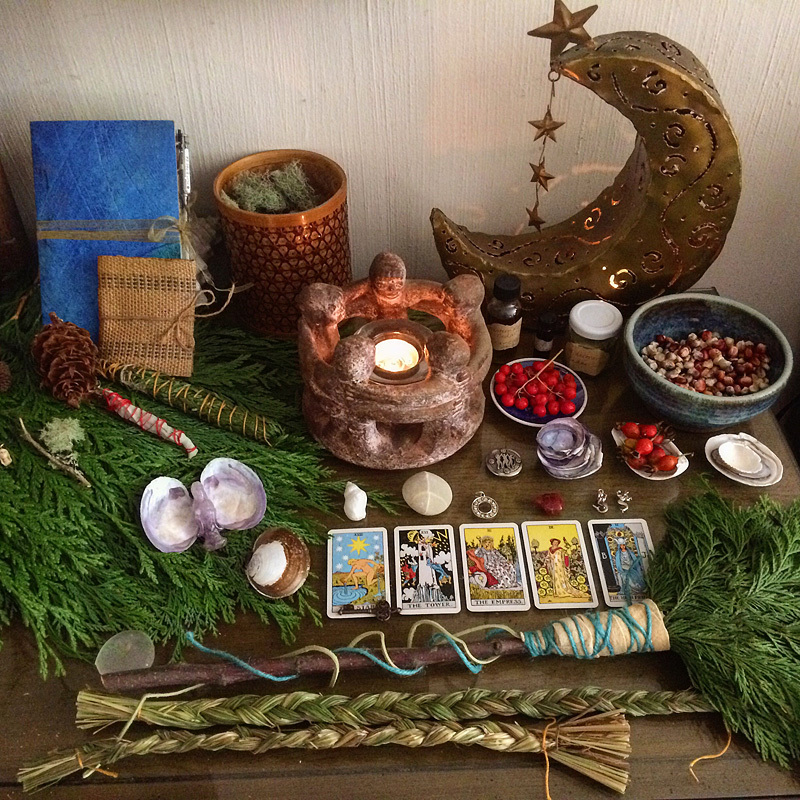 Before we take, it is important to make an offering: a breath, a song, a flower or leaf, a libation of water. She told us, “As we bless the source of life, so are we blessed.” As we walked, I couldn’t help humming Libana’s song “Autumn Time” (Autumn time, red leaves fall / While the weeping sky looks over all / Demeter sadly walks the land / The dying grasses in her hand). The day was bright, but as an old Demeter, I am acutely aware of the transition into the darker half of the year and the descent of Persephone. Our skies were sunny, and only on the last day did the sky weep as we left Aldermarsh. The Grandmother Fir tree was, for me, the Wheel, as we approached the Fall Equinox. This sacred tree outside Marsh House, where we held circle, is the recipient of many offerings. Friday morning’s contemplative beach walk was bliss. I entered a cocoon of solitude, and as the morning was warmer than I expected, soon shed layers of clothing along with stress, worry and perfectionism. Joanna had taught us a lovely Dance of Life the evening before. Serene and centered, I danced the directions, turning and turning, gathering and sending the energies of above and below, of east, south, west and north. As I moved through the motions, my heart lifted and my breath deepened. After a while my eyes focused on the sacred mountain in the mist before me, Mount Ranier. I offered the dance to the water and the mountain, the forest and the sand, and entered a state of grace in my body and soul. When I came home, I offered it to my own place, to the creek and the hills, to the sky and the earth. The land welcomed us, and felt close. 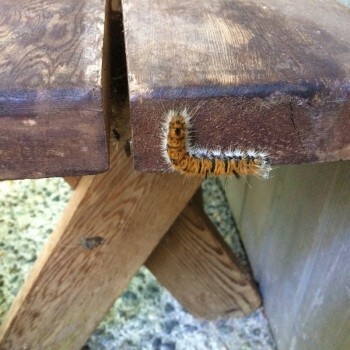 I enjoyed the singular experience of showering outside in privacy in hot water, joined by a fuzzy caterpillar. Bird and animal medicine visited: a young robin visited our circle frequently, singing a riotous song from the peak of the roof into our circle below. We would pause and just listen, so lovely was the song. On our first night there, a pack of coyotes filled the night with a chorus of joyous yips – these youngsters seemed to be competing with each other for the silliest song. My first thought when I heard the sound was “Wow, these women are really whooping it up out there!” for I have been with women who howl at the moon. But there was no moon to speak of, and on closer listen I could hear the wild in the voices and knew it to be near. Other critter sightings: blue heron, osprey and eagle at the seaside; garter snake in the garden, deer and rabbit in the meadow, sister spider (met with mixed feelings by the woman staying in her own cabin in the woods! ), and similarly, a band of hornets deviling another woman at the beach until she found her way into the shelter of some flowering San Juan sage, and they left her alone. Tarot readings were woven into the circle in an organic way, without being the main focus, supporting and revealing things to be aware of and adding an extra layer of insight, as they do in my daily life. I don’t read tarot every day, but at the moons, the sabbats and to ask for guidance. Joanna is working on a new deck, which is super secret, but we were able to see and use some of its cards, and to give her our thoughts and ideas about it, which was a special treat. Like the Gaian Tarot, it is nature-based and quite beautiful, and now we can’t wait until it is published! 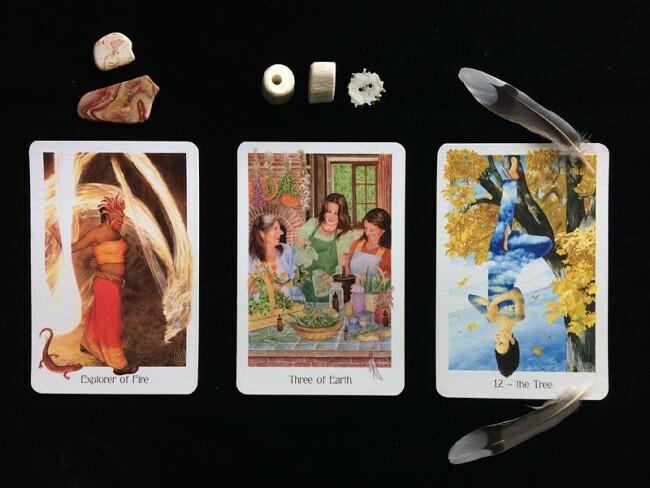 I used Joanna’s Gaian tarot last spring to help me decide if I should go to this retreat. From my journal notes: “The past: It’s still painful. The scars from that burn still ache, as Salamander reminds me. The present: what I long for, and miss, being in sacred community with women, making medicine. This is the exact card I visualized and hoped for, and here it is, right in the center. The future: the Tree/Hanged One. I’m beginning to understand that this card speaks not to a temporary state of indecision which will quickly pass, but to a state of suspension and waiting, maintaining serenity while not knowing, leading to regeneration. A not-untrue description of this last third of life. . . . I have been in seclusion for a long time, doing much inner work. I have found and lost and found my equilibrium. It is not easy for me to venture forth and give up control. I have discovered much to fear in my own body, and cultivated strength of mind. 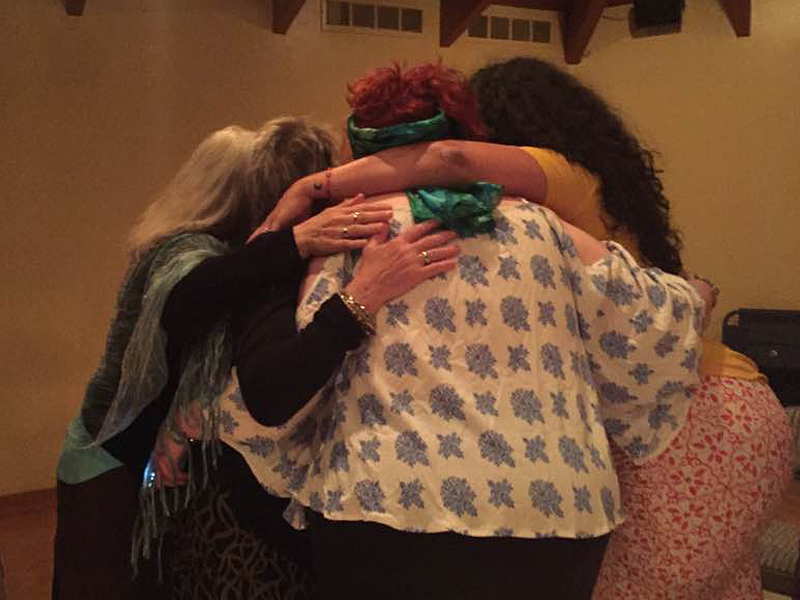 But maybe my soul is lonely for community and shared sacred space.” This reading spoke clearly to my past difficulty, my present desire and my indecision about the future. I am glad I made up my mind and went. A very favorite memory was the closing night circle. After the ceremony, no one wanted to leave, so, sitting around the “campfire” of our altar, with a candle lit for each of us, we began to sing. We sang silly songs and nursery rhymes – Frere Jacque, Itsy Bitsy Spider, Twinkle Little Star, and then moved easily into the sacred songs we had learned and brought to the circle. It was sweet beyond words, to sing together: Circle Round the Wheel, Sing the Frogsong, Mother Carry Me, A Cooking Pot, The Ocean Song. Our sweet closing circle on the last morning was full of wise shares. One of the women expressed her belief in the sustainability of women’s circles: the faces may change, but the circle will go on, and suddenly I understood why “sisterhood is forever.” Another woman imagined us scattering like seeds, to our own places, to bring the grace and beauty and wisdom we had experienced into the world. Joanna expressed her wish that we “make our experience grow corn.” And already we have had one woman introduce a circle to her employees at their business meeting. Can we really change the world, one circle at a time? My travel home was charmed and easy, not always the case when flying these days. As I unpacked after five days away, my husband exclaimed, “You brought the forest home with you!” Yes, yes I did. It is good to be home, though I missed my little kitty who also used to be ecstatic to see me when I returned. The next morning I received this perfect circle sculpture from a friend just passing through town, and it was my signal to sink my growing nostalgia for retreat time into making an altar, with the forest and the sea, some of the cards I drew during the week, my sacred object from the retreat altar charged by every woman there with magic, and the beautiful amethyst Kwan Yin a new friend gave me on the last day, to remind me to offer compassion, even to myself. Every time I pass by, the sweetgrass braids I made with Joanna waft their fragrance up to me and I am transported to that sunny room where the women sang and hummed while we made plant devotions with wakened hands. I received so many gifts in so many ways. Reentry to daily life has been slow and sweet, as I carry the magic home with me. You might say I am between the worlds, full of realizations. Realizations – making things real. Retreat space is removed from mundane life, but it is necessary to fill the well to return to the work of the world. Writing about it here is a way for me to integrate it and revisit the sweetness, and to share it with you. 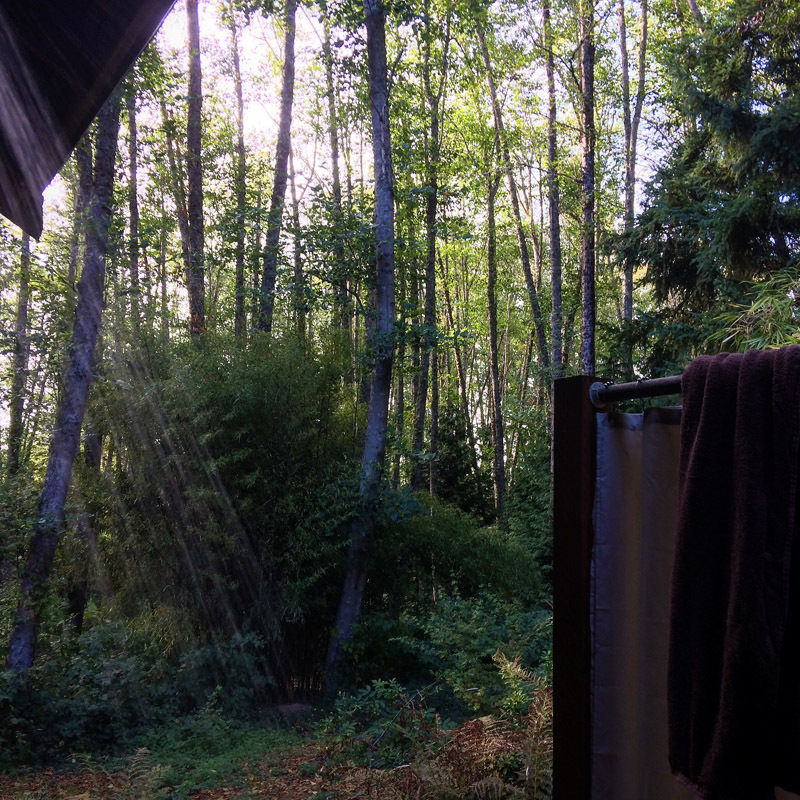 Joanna has written about this retreat here, with more wonderful photos. Thank you for this beautiful sharing. You brought me into the retreat, gave such a clear feeling for what it would be like to be there in circle with the cedar, the coyote, the women, the mountain and the marsh. After seeing your photographs this past week, after reading this evocative description, I may need to go next year. Bright blessings always, Cari. Thank you for your beautiful symphony of words to let others feel some of your experience at this retreat. The line about changing the world one circle at a time brings great hope for a community centered on interdependence and the living in awe of this beautiful planet, with so much beauty and potential for love. I am so blessed to have you for my soul mate. It has sparked my imagination and longing for a women’s circle. I so appreciate this most beautiful word weaving of your experience. To attend one of Joanna’s retreats is high on my list of things I want to do and your descriptions serve to enhance and deepen this desire in my heart. What a blessed gift you have received, as well as passed on, in the sharing of it. Thank you for letting your heart flow onto the pages. Thank you. My heart longs for this. My head keeps me away. Thank you from a grateful heart. I am so glad I chose my moments to savour your report from the retreat zone. You paint a very inviting picture. Sadly, the expense of the trip is beyond my pocket. But it does inspire me to treasure and nurture where women circle here in Ireland. Thank you for the pen portrait and beautiful photographs illustrating this special pause in your life. Also Patrick’s post = ♥ ♥ ♥ The two of you are truly fortunate in one another. Cari, I was slow to come to read this, waiting until things were calm enough here that I could let your words enter me. I knew you were going to write something special, and I was right. Your words, thoughts and impressions are so lovely and inspirational. I love the sense of ‘away’, or time out of or apart from normal time. Sacred time. How lovely that you got to experience five full days of sacred time, sharing, loving energy, feminine spirit and wisdom. I long to go one day. Thank you so much for sharing so deeply of what you took in. Previous post: What falls away is always. And is near.